Directions: Read the summary, take a look at the article, “Q&A: How soon will the federal government get back in order?,” watch the video and then answer the discussion questions. Your students may find it helpful to follow along using the transcript. Summary: On Friday, President Trump announced a deal to reopen the government for three weeks. The funding plan does not include immediate money for a border wall. It will allow Democrats and Republicans to negotiate a longer-term solution to immigration and the border without the shadow of the shutdown hanging over them. Furloughed government workers will get their first paycheck this week since the shutdown began, including backpay. The 35-day shutdown, the longest in American history, was the result of President Donald Trump’s demand that Congress pass a taxpayer-funded border wall with Mexico. If the standoff had continued into February, millions who rely on food stamps or SNAP (Supplemental Nutrition Assistance Program) may have been affected. 1) Essential question: What happened during the federal government shutdown that resulted in President Trump backing down from his demand for a border wall? 2) Why did the federal government partially shutdown? 3) Do you think President Trump should declare a national emergency if he does not get funding for a Mexico-U.S. border wall? Explain your answer. 4) What government offices closed due to the shutdown? What does the term furloughmean? 5) What role does the federal government play in your life? 6) Media literacy question: How did different news outlets cover the shutdown? 7) When he was running for president, Donald Trump promised to build a border wall paid for by Mexico. Trump is now proposing a $5 billion (much less than he cited previously) wall paid for by American taxpayers. Do you think taxpayers should pay for a border wall with Mexico? Why or why not? 9) Media literacy question: What do you see in the two photos below? Why did the protesters use Styrofoam plates? Why were protesters at the Hart Senate Office Building in Washington D.C.? Who do you not see in the pictures? What might that tell you about the situation? 1. If time permits, choose one of the following NewsHour articles to help you further understand the effects of the government shutdown. Pick the article that works best for your students! 2. 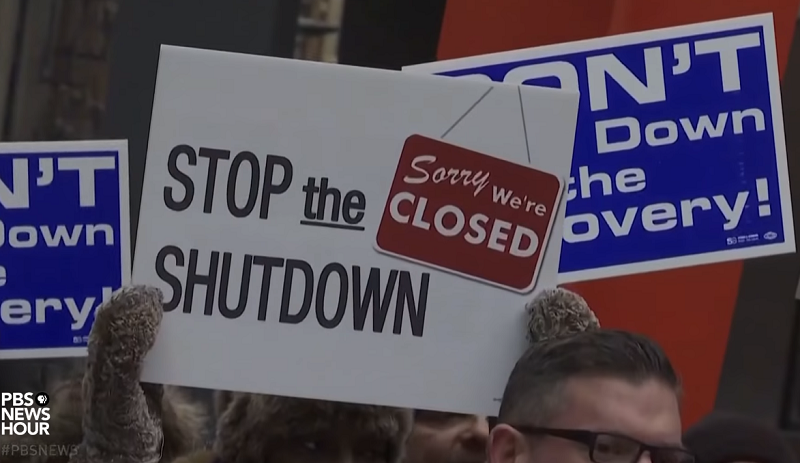 Watch NewsHour’s “Air safety measures are ‘unraveling’ due to shutdown, says air traffic union.” Unions representing air traffic controllers, pilots and flight attendants are warning that the government shutdown compromises the safety of air travel. on Thursday, they gathered at Reagan National Airport with Sen. Mark Warner, D-Va., to express their concerns. Judy Woodruff speaks with Trish Gilbert, vice president of the National Air Traffic Controllers Association, about “unraveling” safety. 3. WATCH: Commerce chief Wilbur Ross asks why furloughed workers are using food banks Commerce Secretary Wilbur Ross, one of the richest people in President Donald Trump’s Cabinet, questioned Thursday why furloughed federal workers were using food banks instead of taking out loans to get through the monthlong partial government shutdown.